I'm writing this pretty early , I don't have any updates on Nyla yet.......I'm going to leave it at that for the moment. I did get to do something really fun this morning.....I was invited by a new volunteer and friend, Julia, to come and give a presentation to her Vet Tech class at Cy Ranch High School. I consider this a real privilege....and I thank Julia, her instructor and all of those attending for giving me such a wonderful welcome. I hope everyone enjoyed my presentation, but I know that bringing a Husky always helps!!!! Laz had a fun time (boy, was he spoiled this morning)....he really didn't want to leave!!!! I have a few pics from the morning.......really had a great time....so good I get to come and talk to another class next week!!!! As you can see, Laz was having a terrible time!!!!!! Me (the old one in blue), Julia (in yellow), Laz and some students!!! BLD is feeling pretty good lately....he is really getting around in his cast.....I think that will change when the cast is off and we have to rehab that leg!!!! All of us will enjoy it while we can. Our friend Cheryl sent him that toy you see above, it's a stuffed chicken and he loves that thing. As you can see he's either throwing it up in the air and catching it....or covering it with his cast so no one else can get to it!!! Thanks Cheryl....our boy knows that it's his and he's taking care of it!!!! Thanks!!!!!! And we're sharing the love!!!! We have a little different post today. We would like to thank our friends, Maggie and Duke at 2 Punk Dogs for passing on the two following awards......Thanks so much for acknowledging us and our Husky rescue. Nominate other bloggers you admire. Lizzy is my first dog.....growing up my family always had cats. 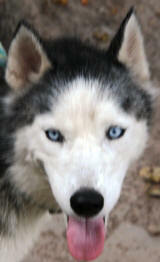 Both Lizzy and TJ were rescues from Husky Haven. Lizzy is Queen of the House.....both boys are her subordinates. Lizzy doesn't woo like most Huskies, she always barks. TJ has beautiful brown and blue bi-eyes. Tank loves to sleep on my black leather couch.....you can't even see him at night. Tank likes to think he's a Husky too!! To copy the Beautiful Blogger Award logo and place it in your post. Nominate 7 other bloggers for their own Beautiful Blogger Award. Yesterday BLD went to the vet to see if, after his last operation, six weeks ago, he was growing any bone. Happy news to report.....he is!!!!! This also meant that he could finally get his apparatus removed. I realized that his first operation was at the beginning of June......this has been a 31/2 month process just to get him here. He now has a splint and wrapping that will stay on for three weeks and new X-rays will be done at that time....we'll see how he progresses from there. It was a relief for our director and myself, we deal with him everyday, and it would have been horrible to have his leg amputated after all this time. He's his usual crazy self......he still won't be hanging out with other dogs soon. 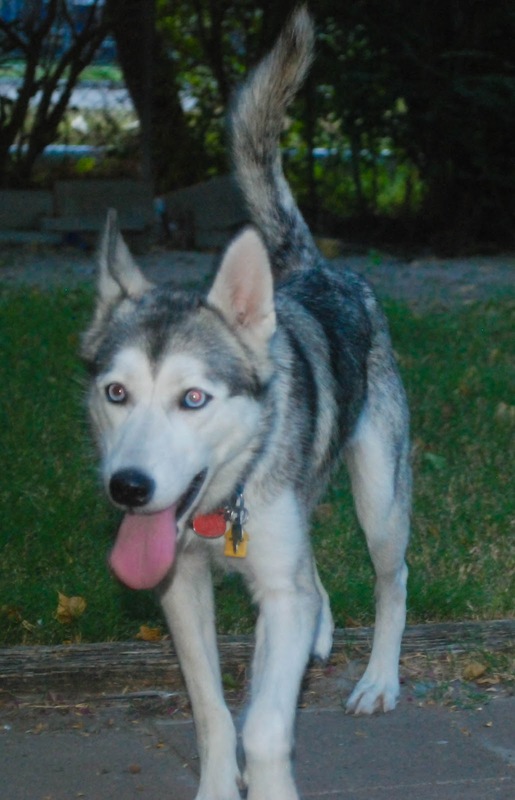 We were joking today....they took off his fall colors and put him in his best Husky Haven colors!!!! I want to thank all of you for your support......and he still has a long way to go.....if you can we still need the donations to help him long term. We will be picking a name soon....and for those of you that don't have your tees yet.....I'm still working on that. Please keep commenting....I love to hear from all of you!!! One more easy thing before I go today.......Chase is running a contest through their Community Giving program and we are one of the charities. If you go to this link and vote we have a chance to win some money to help us along....thanks in advance. So BLD went to the vet this afternoon.....I won't know till tomorrow how that turned out.....keep paws and fingers crossed!!!! I hope this thing comes off soon!!!!! Had a flurry of adoptions and fosters in the last few days .....which is really great!!!! I wanted to show you a pic of Merlin.....he came by with his family this weekend...I didn't get a chance to catch him last time!!! He's such a handsome boy and they really love him!!!! Have fun sweet boy!!!! We had three dogs go into foster care over the weekend......Tamara, Gyla and Kurstyn!!! That was pretty exciting!!!! Tamara and her new foster mom!!! Gyla at her new place!!!! I'm so happy for all these girls......it's so good for them to be in a home....and one on one attention......have a great time my lovely little girls!!!! One more adoption.....Missy. She got adopted mid week, but they came back to Saturday to get her cleaned up and learn more about Huskies...they are first time dog owners!!! They really love her , and the kids think she's great!!! I'm cleaned up and ready to go!!!!! When my human, Miss Ronni, asked me to write this guest article for Miss Liz, a big-hearted volunteer at the Husky Haven in Houston, I didn’t know what I should write about, especially since I’m a belly-rub-seeker by vocation and not a writer. But Miss Ronni seemed to understand my dilemma. “Why don’t you talk about what it’s like to be a rescue?” she asked. Hmmm…Now that I think about it, that must be what Miss Ronni’s talking about. Eight years ago I was born in a North Texas puppy mill that was raided by the police and shut down. A wonderful couple with the Alaskan Malamute Protection League in Bellville, Texas rescued me and I’ve never lived anywhere else. I was very ill and nearly died, but I never blamed anybody. Lots of folks came out to see all of us, but for some reason, no one ever looked at me twice. I didn’t blame anybody for that, either. I just figured that when the right people came along, everything would work out fine. Then, a few months ago and out of the clear blue, Miss Ronni and her husband, Mr. Kevin, came out specifically to meet me. 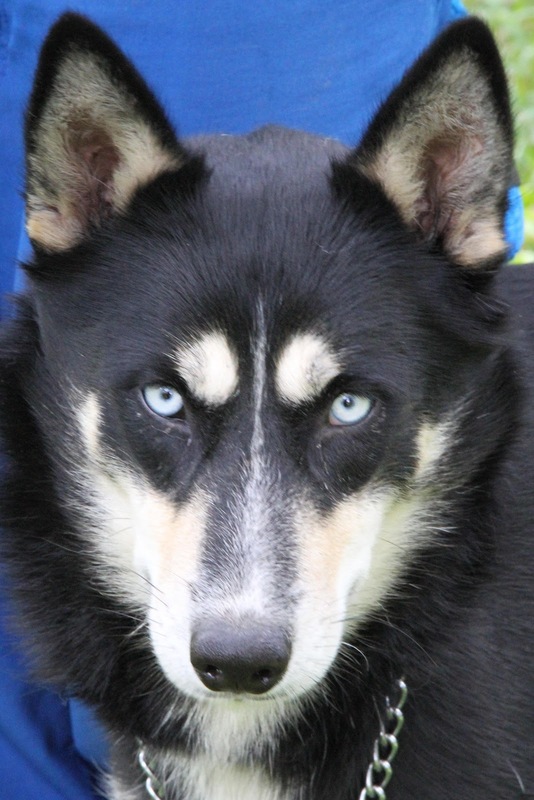 Their other rescue, Koda, was an incredibly handsome husky-mix they had adopted from Husky Haven. But he was young and a little rambunctious, so they wanted a young/older woman to teach him some manners and calm him down. When Koda and I met, we bonded right away and I haven’t seen my heart since. But many of us rescues do. And that’s why we’re such good companions. We’ve been around the world a few times, so we’re smart, loyal, and very, very appreciative. We don’t take you for granted. Your love and attention is important to us. We don’t want to make you mad; we want you to like us. We’re never completely sure that we’re going to be accepted, so we try really, really hard—and when we love, we really, really love. We don’t put conditions on our love and we don’t hold grudges, either. We forgive immediately. We know how short and fragile life is. As a rescue, I understand my job and try to perform it as well as I possibly can. Ronni works at home, so it’s my job to stay right at her feet and be sure she’s okay. If she’s upset about something, it’s my job to rest my head in her lap so she can scratch my ears until she feels better. If there’s a real crisis, it’s my job to roll over and get a long belly rub. Hey, it’s a hard job, but someone’s gotta do it. Ronni and Kevin wanted Koda to have an older woman as a companion, but they’ve discovered that an older dog is good for them as well, since they’re not all that young, either. Everyone thinks about kids needing a puppy—man’s best friend and all that—but an older dog is a much better companion for an older person. Older people who suddenly find themselves alone often talk about how they’ve lost their purpose in life; they no longer have a reason to get up in the morning and they have no one to take care of. If you’ve found yourself in this situation, please take my advice: Turn off the TV right now, go to your nearest animal rescue and adopt an older animal. You could be saving the very life that will enrich yours. Whether you’re thinking of getting a puppy or an older dog, visit a shelter before you spend your hard-earned money on a purebred canine. But if you do have a specific breed in mind, you can visit the website www.akc.org to see where the breed rescues in your area are located. There are so many dogs (and cats!) looking for homes, and so many people looking for animal companions, that you’ll definitely match up somewhere. Anyway, so we had two dogs go to foster care and one get adopted this weekend!!!! Fantastic!!! Our sweet baby , Laylita, got herself a new foster Dad. Here she is giving him a lick on their way home. Laylita has never had a foster , so this will be great for her. She will get some time in a house and some personal attention.....so happy for her!!! Anya..... a wonderful girl that had been in foster care......well she got adopted!! She is about 5 years old and her new owner, a student, fell in love with her! She will be hanging out on campus....having a great time. We will miss you girl.....and wish you the best!!! Want to quickly update BLD. From my point of view.....things don't look good. We have talked to the doc , and tried some alternative therapies and foods that should help, but I think he was just too far gone to have anything help........I hope I'm wrong, he goes for a check-up next week and then we'll know for sure. A lot of people have asked me why we haven't named him......we are going to when his apparatus comes off....if you would still like to donate.....and we can use the help.......go to our Paypal at www.huskyhaven.org. The contest to name him is ongoing....so send your creative name and donation.